Clair is a 10 year old girl who finds adventure in the most unlikely place . . . a city landfill. With the help from her new and unusual friends, she soon discovers the importance of saving our planet by making better choices. Eventually, Clair is able to convince her parents that trash not only has a voice, but should have a choice to its final destination. Her plan? To reach out to others by making music in harmony with the environment. 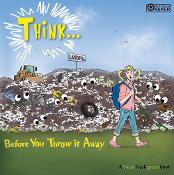 Thanks to Clair’s new musical group, Vocal Trash, we all learn to re-use, recycle and ultimately, "THINK . . . before you throw it away".